The Romance Dish: Fresh as a Daisy! Hello, my name is Anna Campbell. And I'm a Daisy Dalrymple addict. Phew, glad to have got that off my chest! I discovered these wonderful books through Facebook. How terrifically 21st century of me! If only I could work out how to send a text from my cell phone! Carola Dunn posted a couple of really pretty photos of where she lives on the Pacific Coast in the U.S. So I went over to her page and saw she'd written a series of cozy mysteries set in her native England. It immediately became clear that Carola's mysteries had a large and enthusiastic following and that they sounded exactly my cup of tea. The Honorable Daisy Dalrymple is a viscount's daughter determined to support herself financially in 1920s England. So she finds work, much against her aristocratic mother's wishes, writing articles for magazines. 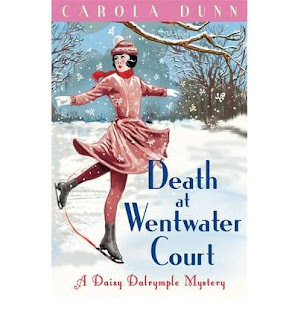 The first story, the enchanting DEATH AT WENTWATER COURT (odd to discribe a murder mystery as enchanting, I know!) covers Daisy's visit to a stately home that is the subject for one of her articles. It's the depths of winter (the house is soon snowed in) and when one of the guests is discovered dead on the skating pond, Daisy turns sleuth to reveal the murderer. So the scene is set for the classic English country home murder mystery, with all the suspects trapped in one spot and our intrepid major character determined to unmask the villain. 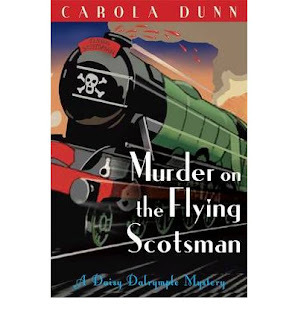 One of the fun things about the Daisy mysteries is that Carola Dunn is clearly a huge fan of the Golden Age of British detective fiction. There are so many sly nods to Agatha Christie and Dorothy L. Sayers and the other classic writers of the 1920s and 1930s. While she's certainly no slouch, Daisy isn't a super-brain like Sherlock Holmes or Peter Wimsey. But she's unthreateningly pretty, outwardly guileless and she has an uncanny talent for making people confide in her. She's also intuitive and observant. So an ordinary girl in many ways, but one who has gifts that make her a great detective. Just before snow closes the house off from the outside world, a couple of policemen from Scotland Yard arrive. Among them is dashing, clever, masterful Chief Inspector Alec Fletcher. Alec is an example of the 'new' man. He's been to university, but not Cambridge or Oxford, and he's middle class. Oh, and he's also all set to become the romantic hero of the series. Alec is alternately annoyed and grateful for Daisy's interference. There's an immediate attraction between them although class differences create a barrier to their courtship. Carola Dunn does a wonderful job of outlining the sometimes uncomfortable relationships that resulted once the world changed after World War I and so many of the old certainties were swept away. One of the many pleasures of the books is that they convey this new world so beautifully even as they don't shy away from the overwhelming tragedy of the recent war. Daisy's brother and fiance were both killed in the trenches and her father died in the Spanish flu epidemic shortly afterwards so a cousin inherits the estate where she grew up. Daisy, brought up to a privileged life, is suddenly left to make her own way - and she does it with guts and grace so you like her even more. She really is such an appealing heroine! 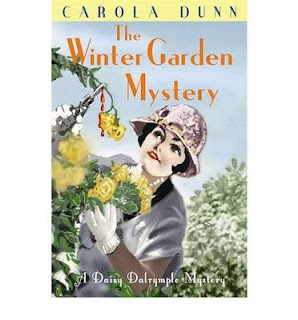 The setup for the second book in the series THE WINTERGARDEN MYSTERY is similar - Daisy is on assignment to write another article and Alec turns up to solve the crime and to become even more enamoured. In the third book, REQUIEM FOR A MEZZO, Alec and Daisy witness a murder at a concert at the Royal Albert Hall when he's finally asked her on a date. Alec's oft-repeated complaint that Daisy's always stumbling over dead bodies seems justified! The fourth in the series is one of my favourites. MURDER ON THE FLYING SCOTSMAN features a cast of wildly eccentric characters. It's a fun nod to books like MURDER ON THE ORIENT EXPRESS, except instead of Poirot with his moustache, we get sweet but perspicacious Daisy and her guileless blue eyes that always discern the baddie. As you can probably gather, these are definitely on the lighthearted end of the murder mystery spectrum. There's never much gore or explicit violence and while there's suspense, it's not going to give you nightmares. What you get in these books is a really fun reading experience and a lovely, slowly developing romance. There's a sparkle and a verve that I find impossible to resist. A lot of that sparkle comes from the scrupulously observed 1920s atmosphere. The glamorous clothes, music, cocktails, cars and the quaint slang. Daisy is in a perfect position to show us society from the nobility through to Chelsea bohemia. Many of the characters Daisy encounters could step right out of a P.G. Wodehouse, what ho! I've just read the ninth DD mystery, TO DAVY JONES BELOW. I'm waiting on tenterhooks for the tenth THE CASE OF THE MURDERED MUCKRAKER (how could you resist that title?) to arrive from the Book Depository. If you want to spend a topping couple of hours with a lovely heroine and her dashing beau, I'd strongly recommend picking up a Daisy Dalrymple mystery. Anna, thanks once again for introducing another *new-to-me* author. I saw at Goodreads that you gave Davey Jones 5 stars, I was intrigued then, how wonderful to read a whole blog on these books! Karyn, snickering about riding The Flying Scotsman. I've actually been on it and it's all quite prosaic in this day of diesel and commuters. Every time I read one of these books, I close it at the end with a smile on my face. I think that's pretty good value! The books look wonderful & I just love the name Daisy Dalrymple. I enjoy a great mystery. Sounds like a fabulous series, Anna! I'm looking forward to reading it. Mary, you kind of know you're going to be in charming territory with a name like Daisy Dalrymple, don't you? Thanks for swinging by! Christine, I put the first one aside for you. I think you'll really enjoy them. I loved the first Daisy book and am already looking forward to the rest, though with trepidation - I suspect that wherever Daisy treads there'll be a murder. hero is handled, and the social sensitivities. A real treat for me as a fan of Dorothy L Sayers and PG Wodehouse! Annie, there's this running joke about Alec getting crankier and crankier about Daisy's penchant for tripping over corpses. It's made their courtship really eventful - not in the way they would have liked! So glad you enjoyed the first one. I've enjoyed every one in the series. There's a terrifically fun one set in the Natural History Museum in South Kensington called Rattle His Bones. Full of eccentric palaeontologists. And dinosaurs. Oh, and dead bodies! Hey, Karyn, just noticed Ranelaw rules at the bottom of your post! Whoo-hoooo!!!! How could I have missed that? Did you sneak back and rewrite your post when I wasn't looking, you sneaky person? Hey, cool! Thank you! Hey there, Anna!! You know, I have to say, I look forward to your blog every month anxious to see what new you will introduce to me this time. These books sounds fabulous! As a side note, I giggled a bit when I read about The Flying Scotsman. It makes me think of Thomas the Train and all the fun my boys had playing with those trains, one of which was The Flying Scotsman. Thanks for the great recommendation! These sound lovely! Hooray! I love the Daisy Dalrymple mysteries. I found them at my local library not too long ago, and now I've read them all. Can't wait for the next--I hope there will be more. I love this Second Helping, Anna! I put the first few books in my online shopping cart as soon as you told me about them. I will be adding a few more and purchasing them ASAP! Thanks, Anna! Buffie, you're not talking about riding that Flying Scotsman too, are you? Snort! That Karyn is NAUGHTY!!! Hey, thanks for saying you look forward to the reviews. I really look forward to sharing books I've loved with everyone. 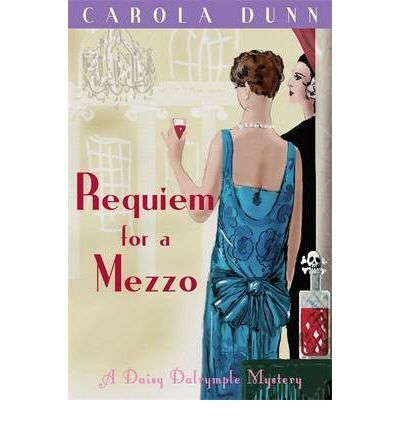 I really only discovered these by chance - cozy mysteries were a whole nuther universe! Deb, I think these would appeal to you a lot. They've got the flavor of a really good trad Regency about them - you know, that sparkle in the dialogue and the use of setting as a major part of the story. Saralee, I was checking out Carola's Facebook page yesterday and it looks like there are definitely more to come. How fantastic you're a fan! A lot of my friends didn't know these books at all - although they do now that I've been raving about them for the last six months! Andrea, so glad I've turned you onto these books. I hope you love them. They just felt like a breath of fresh air to me when I picked up the first one and continued to devour them! I'm desperately awaiting the arrival of the Case of the Murdered Muckraker as we speak. Just heard from the Book Depository that it's on its way. Huzzah! Actually I'd strongly recommend reading the books in order if you can - it's lovely watching the relationship develop between Daisy and Alec. Carol, you always crack me up! Deny a Scotsman, indeed! Even if he's flying? Gannon, my address is c/- the Flying Scotsman. That's if I can wrench him away from Carol and Karyn! LOL! It's terrible for the Visa card how many good books are out there, isn't it? When the read turns out to be as fun as these, I can't say I really mind, though. Anna, I always look forward to the 24th of each month to discover what books/authors you'll be spotlighting. I've been introduced to so many wonderful ones through your blogs. The Daisy Dalrymple Mysteries sound like an absolute delight and I do love a good cozy mystery. I have no doubt I'll be adding them to my collection. Spiffing!?! I ADORE it! I'll be buying Miss Daisy at the next opportunity. Grins. Karyn, I have to second your comment - both about it being naughty and wanting to do it - regarding riding the Flying Scotsman. Snork. Now that sounds even naughtier, doesn't it? Hahah! Anna said: There's a terrifically fun one set in the Natural History Museum in South Kensington called Rattle His Bones. Full of eccentric palaeontologists. And dinosaurs. Oh, and dead bodies! Heehee. You KNOW how I love a good dead body, so I'll look forward to getting to this one too. Anna, I'm a Daisy fan too and have been since the first one was published. Now I'm eagerly awaiting #19--Anthem for Doomed Youth, set for release March 29. My library had Dunn's trad Regencies (Anyone remember the Walker hardbacks? ), and I began reading those in the 80s. I tend to follow authors I like when they switch genres. So, of course, I read Dunn's mysteries. I found Daisy a delight from the beginning. I have also enjoyed Dunn's other mystery series, which is set in Cornwall in the 1960s. Hey, it's Carola herself! Wow. Carola, these books sound fabulous. I'm glad Anna brought them to our attention! Lucky us. So glad to "meet" you here, as well. Grins. *blush* I tent to get naughty the later the night gets! And Jeanne, I knew you would like that! Waves at Carola, I will be sure to check out your website, your books sound wonderful. Karyn said: *blush* I tend to get naughty the later the night gets! And Jeanne, I knew you would like that! Hi Carola! Thank you for stopping by! Karyn, Ranelaw and I have been getting to know one another today. He certainly makes a lasting impression! Anna, I'll definitely be reading them in order or my OCD will kick in! Ha! Oh Anna, A new series for me! I share your love of Georgette Heyer and your books, of course! I love cozies.......do I need to start at the beginning? PJ, I've really lost touch with what's out in cozy mysteries over the years. I blame that Kate Carlisle and her wonderful Bibliophile mysteries for getting me back into the craze. I particularly like the historical ones - no surprise there, I guess. Give Daisy a go! I think you'll like her. Goodness me! I hope this Scotsman has had his haggis. Sounds like he's going to need some stamina with all you gals! Snork! Karyn, you started something! Jeanne, I really think Daisy would appeal to you! Jeanne and I had a memorable afternoon in the Smithsonian Natural History Museum. She wanted to look at dead bodies (there was a fascinating and huge Jamestown exhibition so she had plenty to choose from) and I wanted to look at bling. Give me the Hope Diamond over someone who's lost all hope of life any day! Janga, I was really stoked when I found out you were a fan too. Aren't they great books? Just the perfect antidote when you're having a blah day. I'll have to check out Carola's other books. I can actually imagine she did a wonderful Regency romance - I commented in one of the earlier posts that the mysteries have that lovely sparkle that a great trad Regency has. Carola! Lovely to see you here! And nice to have you sharing the love! Thanks for writing such fabulous books. As you have probably gathered, I'm definitely a Daisyophile! Jeanne, isn't it cool Carola swung by? Daisy has a page on Facebook too: http://www.facebook.com/#!/pages/Daisy-Dalrymple/232685538107 As I discovered yesterday! Karyn, how cool you're reviewing Midnight's Wild Passion. It's two months till release (tomorrow) and as you can imagine, I'm champing at the bit! Ooh, PJ, you're dipping into Midnight's Wild Passion too? Do you have a Flying Scotsman to keep you company? Snork! I loved writing Ranelaw. He's my first REAL rake and he was such fun to torment! Andrea, I get that sort of OCD too. I was only missing one book (I've bought all the rest although some are still waiting to return to print) but found out yesterday that The Bloody Tower will be out in October. Huzzah! Hey, Connie, me and GH? That's my favorite post yet! Yeah, I know I'm shallow. Thank you! I'd definitely recommend reading them in order. The murders stand alone but the romance develops through the books and it's so beautifully done, it's lovely to watch each new step Alec and Daisy take together. Anna said: Give me the Hope Diamond over someone who's lost all hope of life any day! And piffle to you, Miss Anna, for maligning the malingering, mayhem reduced mummies from Jamestown! Anna said: Ooh, PJ, you're dipping into Midnight's Wild Passion too? Do you have a Flying Scotsman to keep you company? Wow, that Scotsman gets around! Snork. I'm ROFLMAO because the Word Verification for my last post - kid you not - was "Undies"
Actually, Jeanne, to give the TRUE depiction of that day, I found the Jamestown mummies absolutely fascinating. And do you remember how enchanting it was to stand in the butterfly house and have those beautiful butterflies fluttering around us? It was a great day, wasn't it? Still think the Hope Diamond was my fave though - and who knew it was a rich, beautiful blue? Jeanne, for shame! No Flying Scotsman wears UNDIES!!!! Anna said: It was a great day, wasn't it? Still think the Hope Diamond was my fave though - and who knew it was a rich, beautiful blue? Anna said: Jeanne, for shame! No Flying Scotsman wears UNDIES!!!! Oh, should have known you'd be up with what a Scotsman wears under his kilt, J! thank you anna. always looking for someone new to read. this is one i will definately check out. thanks for the info. Sounds delightful. The English mystery done in this style is such a joy to read. It sounds like we have a delightful heroine and couple to follow. I wonder if BBC will pick them up for Masterpiece Theater. They sound like they would be a hit. Hey, Chris, thanks for swinging by and so glad I've intrigued you enough to check out the Daisy books! Happy reading! You know, Pat, I hadn't thought about that but they'd be great as TV adaptations. I think that 20s stuff done in the high style makes great viewing - a little bit Wodehouse meets Brideshead Revisited! Sorry to join the party a day late, so hope you get this post. The books sound really good and fun. I love the covers; very 1920-ish and Daisy looks like a grown-up kewpie doll--cute and stylish. Thanks for the heads-up, Anna. I'll check into these stories. Deb, definitely check them out. I think they're just like a breath of fresh air. And as you say, aren't the covers cute?